Vicky Blanche is a true champion and advocate for her Western North Carolina communities. She loves the balance between the city and the mountains and how there is truly something for everyone here! Whether you are an outdoor enthusiast, beer brewer, foodie, or arts & music connoisseur, this is the perfect place to call HOME! Vicky moved to Asheville 10 years ago from Dayton, Ohio, where she previously worked as a Software Engineer for LexisNexis. 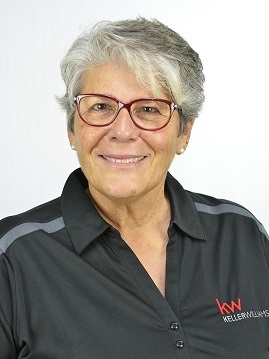 After retiring from that position, Vicky decided to follow her passion for helping people and became a Realtor with Keller Williams in 2011. With each of her clients Vicky makes a commitment “to educate, guide, and provide personal attention on all aspects of their real estate transaction”. No matter if they are Buying or Selling, Vicky works diligently to give her clients the best real estate experience each and every time. With much of her business built on referrals and testimonials from her past clients, it’s clear that Vicky Blanche goes the extra mile to make their real estate dreams come true! Vicky is a member of the Asheville Board of Realtors, NC Board of Realtors and National Association of Realtors, and most commonly works with First Time Buyers, Relocations, and Downsizing/Upgrades. In her spare time she enjoys dancing, playing golf, and Jazzercise. If you are looking to buy or sell, Vicky wants to help you make the right move in this great mountain community! Call Vicky Blanche at 828-254-1973 today to put her experience and diligence to work for you! Me mudé a Asheville hace 10 años mientras trabajaba como Ingeniera de Software para la compañía de LexisNexis en Dayton, Ohio. Pude trabajar desde casa durante 5 años hasta mi jubilación. Fue entonces que decidí convertirme en un agente de bienes raíces. Me encanta y me apasiona mucho. He sido un agente con Keller Williams desde 2011. Me encanta esta ciudad, sus montañas, la gente y la diversidad. Asheville tiene algo para todos, ya sea un entusiasta al aire libre, un amante de la comida o la cerveza la ciudad tiene algo que ofrecer. Como su agente de Keller Williams, voy a educar, guiar y proporcionarle la atención personal en todos los aspectos de su transacción de bienes raíces. No importa si usted está comprando o vendiendo, voy a trabajar duro para ofrecerle la mejor experiencia de bienes raíces posible. Juntos haremos que sus sueños inmobiliarios se hagan realidad. Llámeme hoy al 828-254-1973 para ver cómo mejor puedo servir sus necesidades de bienes raíces. ¡Déjame ayudarte a conocer esta gran comunidad de montaña! Miembro de Asheville Junta de Agentes de Bienes Raíces, NC Junta de Agentes de Bienes Raíces y Asociación Nacional de Agentes de Bienes Raíces. Trabajo comúnmente con compradores de la primera vez, Reubicaciones y Reducciones / Actualizaciones. Mi negocio se basa en referencias y le agradezco a todos ustedes el envío de clientes. Gracias por su apoyo.